No BS, No cliche, specific tips on how to do well on your EM rotation. The ideal attitude of an EM student. Cancelling my episode this week. Be careful with what you post online and find a mentor! Congratulations on getting those applications submitted! This week I will give some tips for interview season. Kidney stones are a diagnosis of exclusion. When you see flank pain or testicular pain or lower abdominal pain on that triage note, you have to consider leaking abdominal aortic aneurysm as well. Kidney stones are a diagnosis of exclusion. When you see flank pain or testicular pain or lower abdominal pain on the triage note, you have to consider testicular torsion. Testicular torsion is a high risk, high morbidity diagnosis that is very time sensitive. In this 5 part series I will be reflecting on a list of non-clinical stuff I learned while in residency. This week: showing up on time, voicing concerns, written evaluations, and watching what you say. In this 5 part series I will be reflecting on a list of non-clinical stuff I learned while in residency. This week: managing time, what to study during your 1st year of residency, sleep, and annoying colleagues. In this 5 part series I will be reflecting on a list of non-clinical stuff I learned while in residency. This week: podcasts, heroes, the pillars of EM, and disagreeing with your attending. In this 5 part series I will be reflecting on a list of non-clinical stuff I learned while in residency. This week: disability insurance, stuff that gets you fired, and “purpose”. Vents are easy!!!! Today we will discuss the basic approach to using a ventilator machine. Cold. Dark. Quiet. Get exercise. Avoid alcohol. You have to be very knowledgable about occupational exposures because this is the only chief complaint that I guarantee, you will eventually manage in a colleague. LEARN THIS. Breast complaints are usually pretty straight forward. Just remember that all breast complaints are cancer until proven otherwise. Neonatal conjunctivitis is a quick topic, but has some big LIFE THREATS which you’ll need to know for both real life and your test. This is a concept episode for a series of lectures on Emergency Dermatology (one of my favorite topics). Over the course of several episodes, we will develop an organized, systematic, visual approach to the diagnosis of all life threatening rashes as well as the majority of the other rashes you will see in the ED. When patient’s come in with MI or shortly after having an MI, you need to think beyond “Is this another heart attack?”. There is a whole list of complications from heart attacks that you need to remember, and that is what we’re covering this week. tPA bleeding isn’t the most high yield scenario for your clerkship, but it is a perfect case to review the physiology of hemostasis and also might save a life when you’re a resident or attending someday. tPA is currently the core treatment for ischemic stroke, and this week we will discuss some of the physiology on how this drug works as well as how to remember a VERY important list of tPA contraindications. In this episode we will discuss 5 major allopathic Emergency Medicine organizations in the US and the differences between them. There have been numerous changes recently in sepsis definitions. This is an update to our sepsis episode from last year. When we get labs, we are usually getting a CBC as part of our testing. This week we will discuss what to do when the patient has a thrombocytopenia that you weren’t expecting. Nausea and vomiting has a HUGE differential diagnosis but usually ends up being simple gastritis in the end. This week we will discuss a basic approach, treatment protocol, as well as to help out your attending. We commonly see patients with advanced liver disease in the Emergency Department and we screen all of them for 5 common complications every time. For our series finale we will review the 5 mega abdominal emergencies in kids as well as briefly discuss non-accidental trauma. Don’t be scared of the inborn errors of metabolism and endocrinology. They are really quite simple to screen for. Focus less on knowing the details of each one, and more on the general concept of what byproducts are building up and what substance is missing. Cyanosis, difficulty feeding, failure to thrive, and shock can all be the presenting symptom of a cardiac abnormality. We will briefly overview cyanotic heart lesions, ductal dependent lesions, and CHF today. This is the introduction episode for our upcoming series on the approach to a sick child. As another special holiday treat we will be talking about the Big 3 hemostatic disorders that make people bleed too easily and how to fix them. Have a great week. No episode. We’re working on updating the show notes. Performing an emergency delivery is very intimidating. The good news is that in most scenarios, as long as you don’t drop the baby, it should go very naturally. However, there are exceptions to this which we will cover today. EM physicians are the masters of EKG interpretation. We will cover an organized EKG interpretation system today with an emphasis on identifying life threats, and this will act as the foundation for your EKG interpretation skills for the rest of your career. Sick. Not sick. This week we will discuss the fundamental pediatric exam that you need to remember regardless of how the patient looks. Really sick kids and babies are some of the scariest and most difficult cases we get in Emergency Medicine. This week we’re going to start with the general approach to the less-sick pediatric patient. We will use this as the groundwork for future episodes. Diarrhea is almost always a benign complaint, especially in well appearing patients, with stable vitals, and a lack of red flags. This week we will cover those red flags as well as some basic treatments when a patient is complaining of bad diarrhea. I’ve been getting lots of emails regarding which CT scan is the right scan to order in different situations. Contrast? No contrast? ORAL contrast? There are so many options! I recommend you know the core, high yield CT scans, and over time you’ll pick up the rest. The approach to bradycardia is very simple and straightforward. The most important thing is to remember you differential diagnosis. After that, it’s a simple algorithm that you’ll never forget. IV fluids are something we deal with everyday in the emergency department. This podcast will teach you what you need to know about giving fluids. On occasion, seizures won’t stop, or a seizure lasts longer then 5 minutes. Unlike a simple, single, resolved seizure, status epilepticus is an emergency. In these scenarios, we add to the descriptive and diagnostic workup discussed last week, and move on to a focused treatment algorithm to stop the seizure as soon as possible. 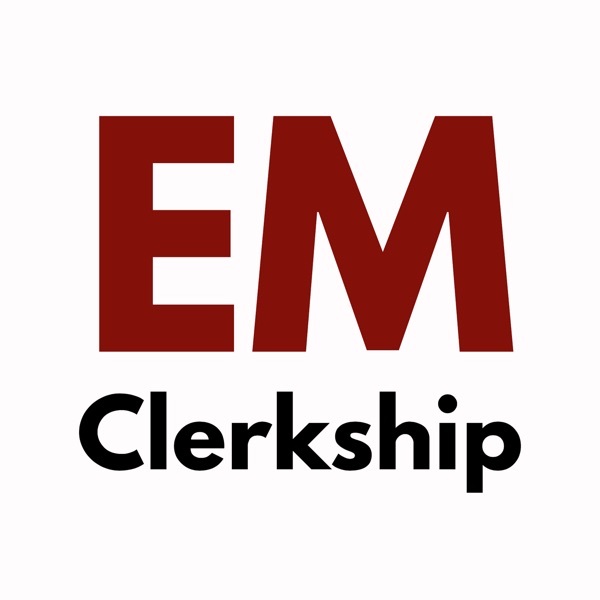 You will probably witness a few cardiac arrest cases during your clerkship. Sometimes these happen in the hospital, but usually these patient’s will be brought into the ED, CPR in progress, by EMS. Just like in trauma, we follow a very basic, logical algorithm when we resuscitate these patients, and this algorithm is called ACLS. COPD and asthma exacerbations are two of the most common pulmonary diseases we encounter in Emergency Medicine, and the severity of these attacks can vary from mild and basic to severe. It’s a clinical diagnosis, but there are lots of treatments to consider. Don’t be overwhelmed, we will cover a basic approach today. One of the most dangerous complaints in all of Emergency Medicine is the GI Bleed. Especially upper GI bleeds when patients are complaining of coffee ground emesis or black sticky poop. This week we will discuss the overall approach to anybody who comes in with a GI bleed. This is the follow up to our previous episode on vaginal bleeding. This week, we will discuss an approach to vaginal bleeding when the patient is NOT pregnant. This is one of the most common chief complaints in all of Emergency Medicine. You will have one of these cases during your rotation. The most important thing to remember are your 5 tests and also how to present these cases to your attending. This week we are going to cover a basic approach to the constipated patient with a focus on the possible treatments for constipation. You’ve heard about this story by now. Today we are going to talk about what happened at the Summa EM residency program and why it closed. Even more importantly, we are going to discuss what we can learn from this and how to be smarter when choosing residency programs in the future. In this episode we will be discussing a laceration repair procedure. Don’t overcomplicate things. Keep it nice and simple. And you will be successful. One of the most common procedures we do in the emergency department is procedural sedation. One doctor does the primary procedure, one doctor pushes meds and watches airway. There are 5 common medications that I have seen used in the ED. We will cover these as well as the general approach today. Lets talk about oxygen. Hypoxia is bad, and we need to know how to help these patients. However, giving TOO much oxygen is also bad. In this episode we will review the basics of oxygen administration as well as review the current literature so you can impress your attendings when they try to pimp you. Today we are talking about one of the most dangerous disorders a patient can have… Sepsis. There is a lot to cover with this including the history of sepsis management, definitions, and a modern day approach. We will cover each of these things and more in this week’s episode. For our last trauma episode, we will be covering the basic approach to injuries in pregnant women. These can be very stressful cases, but the good news is that the approach is very straight forward. It’s just 5 extra interventions you have to perform in addition to your normal trauma resuscitation. Leg injury is one of the most common types of trauma we see in Emergency Medicine. The most important thing to remember about these types of injuries are the Ottawa rules. These are very VERY high yield. Learn them now and you will be well prepared for your rotation. Genitourinary injuries are an often neglected aspect of trauma, but they are very important because they lead to long term morbidity if missed. In this episode we will cover a general approach to GU trauma as well as the 4 main injuries types you will encounter. Injuries to the chest are one of the most common, most life-threatening, and most important injuries that occur during severe trauma. In this episode we will cover injuries to the lungs with a specific focus on the 3 life threatening diagnoses that must be considered during every case: tension pneumothorax, open pneumothorax, and hemothorax. We are continuing our trauma series this week and will be discussing facial trauma. Severe injuries to the face sound complicated, but I promise you they’re not. In this episode we will cover the basic management of all facial trauma as well as the 6 major injuries you might see during your rotation.